Vaikom Satyagraha today remains as just another milestone while consolidating different instances from history covering India’s struggle for independence. More than a century ago, upon witnessing the extent of discrimination inflicted upon lower caste Hindu communities under the archaic and rigid caste system in the erstwhile princely states of Kerala, Swami Vivekananda was enraged enough to call the state a lunatic asylum. Imagine being punished for entering places of worship or even walking along the path that led to one because you belonged to a lower caste. Well, in today’s age and time, such a restriction would not just be impossible to understand but also a direct infringement of one’s human rights. Sadly, this was the grotesque reality in Kerala at that time. However, one movement was to script a historic change that would overturn the fate of Kerala forever by not only shaking the foundations of an extremely outdated and regressive practice but also laying the foundation for a better and equitable world for the coming generations. 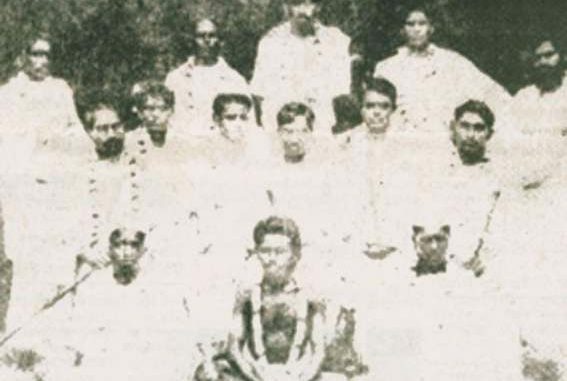 The flag-bearers of Vaikom Satyagraha. Source: Wikimedia. Carrying the namesake of the backwater town in Kottayam district where it was staged between the years of 1924-25, the Vaikom Satyagraha could be termed as one of the best examples for citing how independence from our own regressive social practices was important to fight the greater war against the colonisers. Part of the princely state of Travancore, Vaikom witnessed what could be called the first-ever organised movement for the rights of people deemed ‘untouchable’ and other socially ostracised communities in Kerala at a scale previously inconceivable! One could undoubtedly say that TK Madhavan, a prominent social reformer and the editor of Deshabhimani, a Malayalam newspaper, was the original architect behind the Vaikom Satyagraha. He courageously presented a resolution seeking permission of temple entry and right to worship to all people irrespective of caste and community at Sree Moolam Praja Sabha, the legislative council of Travancore in 1918. Upon receiving severe backlash and further oppression from upper caste Hindus in the council, it took Madhavan another five years of active petitioning before finally moving the resolution to a higher platform—the Kakinada session of the Indian National Congress party in 1923. The architect of Vaikom Satyagraha, TK Madhavan. Source: Ezhava Service Society Canada/ Facebook. This report not only ended up gaining nationwide support during the meeting but also paved the way for the formation of a committee in Kerala encompassing people from different sections of the society. Chaired by K Kelappan, this committee found strong personalities like Madhavan, Velayudha Menon, KP Kesava Menon, K Neelakantan Namboothiri and TR Krishnaswami Iyer as its members. Together, these satyagrahis laid the stepping-stones of the ‘Kerala Paryatanam’ movement in February 1924, with the goal that temples would not only allow everyone in their premises but also open up public roads for people irrespective of their caste or creed. Interestingly, during this period of active resistance and advocacy, Madhavan found great support from Mahatma Gandhi during a brief meeting held in Tirunelveli in 1921, with the latter declaring that Kerala was ripe for a temple entry agitation. To flag off this historic movement, the committee zeroed in on the Mahadeva temple in Vaikom, because of the temple board’s extremely stringent rules regarding entry. On March 30, batches of three from oppressed communities tried to barge into the temple, only to be resisted and arrested by the Travancore police forces. Because leaders like Gandhi, Chattampi Swamikal and Sree Narayana Guru had backed the movement with unfaltering support, the persistence and resolve of the satyagrahis at Vaikom slowly started gaining momentum across the country, with support flowing in from different religions. Even Akalis came to the support of the movement, by setting up camp at Vaikom and preparing food for the satyagrahis as they persisted with their objectives. The Akali support during Vaikom Satyagraha. Source: Wikimedia. With the idea of resolving the issue by opening the doors for discussion between both parties, Gandhi advised the satyagrahis to hold off the movement for the time being. But nothing came out of it, for the upper caste communities refused to come anywhere near a compromise. Soon, the movement was brought back with renewed resolve and determination, and this time the arrests weren’t limited to just the activists but also the flag bearers of the Vaikom movement, including Madhavan and Kesava Menon. Even EV Ramaswami Naicker or the legendary Periyar, who came all the way from Tamil Nadu to support the historic movement, was put behind bars. On October 1, 1924, a group of people belonging to the forward castes marched in a procession with a petition to the then regent Maharani Sethulakshmi Bai of Travancore, that carried approximately 25,000 signatures for allowing entry to the temple for everyone. Led by Mannathu Padmanabhan Nair from Vaikom, the march initially began with approximately 500 people. Along the way, several people joined in, and by the time the procession reached Thiruvananthapuram in November, the strength had increased to a whopping 5,000! Periyar and Gandhi during Vaikom Satyagraha. Source: Wikimedia (left and right). Sadly, no immediate action came from the 609-day long Vaikom Satyagraha, though it left a long-lasting impact in history as one of the most non-violent struggles against caste oppression and discrimination. It would later be documented as a precursor to the Indian war of independence. While it would take yet another year for the gates of the temples in Kerala (except for the eastern gate) to open for people from all castes, it was nevertheless a landmark achievement for the oppressed communities in the state. It was finally in 1928 that the ‘backward’ castes secured the right to walk on public roads leading to temples in Travancore. This opened a new chapter the history of the state where overthrowing the regressively hierarchical caste oppression didn’t seem implausible anymore. Vaikom Satyagraha today is observed as just another milestone while consolidating different instances from history covering India’s struggle for independence. A memorial statue commemorating the Vaikom Satyagraha at Vaikom. Source: Facebook. However, the fact that that it was possibly one of the first organised movements of such a scale in India, against its internal social vices, shouldn’t fade away with sands of time. Neither should we forget the unparalleled contribution of unsung satyagrahis like TK Madhavan, K Kelappan or KP Kesava Menon. Without their persistence and rock-solid resolution towards abolishing the regressive caste system and making the world equal for everyone, Kerala probably would have scripted a very different history.